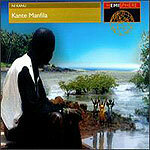 Guitarist/singer Kante Manfila is one of the most popular musicians in Africa today. A founding member of the popular Les Ambassadeurs du Motel in the 1970s, on his latest release Manfila continues his blending of different West African traditions into a melodic, accessible mix. Taking themes and styles from his native Guinea, and his adopted Mali and Ivory Coast, he also uses Western synthesizers for a sound that is both familiar and exotic to American ears. His songs' lyrics tackle contemporary issues facing Africa as it tries to rush to modernity.